Simplot’s Leggo’s brand is now selling its pasta sauce in re-designed packaging. 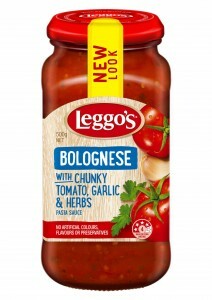 The new labelling includes a health star rating which Leggo’s says is a first in the branded Italian sauces category. 70 per cent of the Leggo’s pasta range has been awarded a 4 star rating which is displayed on the front new jars. The jars now also have a red lid instead of a gold one and new graphics have been designed for the rest of the product. The new-look products will be available in Coles supermarkets from March 2016 and from Woolworths and independent supermarkets from April 2016. The recommended retail prices for Leggo’s pasta sauces are AUD$2.99 for a 490g or 500g jar. The recommended retail price for Leggo’s pasta bake sauces start at AUD$3.74 for a 490g jar.